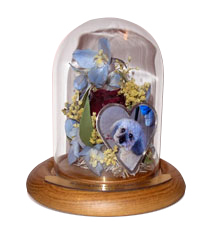 Your flowers are preserved and creatively placed in an encasement of your choice. 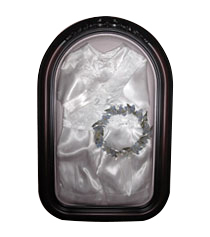 Display encasements include frames, domes, shadow boxes and jewelry boxes. 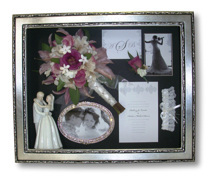 Photos, invitations and other memorabilia can be added where space is available at no additional cost. Most flowers and greenery are dried in 3 to 5 days. Our superior drying method produces better shape and color retention. Click here to see before and after examples. 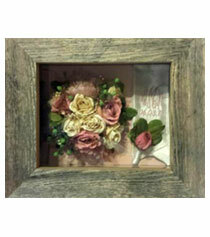 Preserve the bridal bouquet, a bridesmaid&apos;s bouquet, Mom&apos;s corsage, a boutonniere and other wedding flowers. When there is space in your chosen encasement we can include other items such as an invitation, a picture, or your cake server at no additional charge. We encourage your floral preservation to be a part of your wedding planning process. 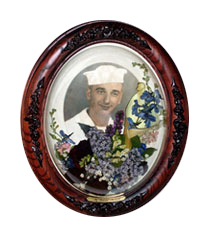 See what flowers preserve best and our tips for preparing your flowers for preservation. Include the groom's boutonniere in the same encasement as your bridal bouquet at no additional charge. 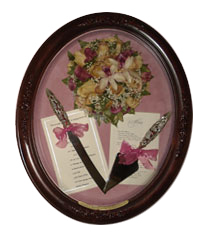 Encase your maid-/matron-of-honor's bouquet in a beautiful shadowbox or oval frame and give it as a gift for her participation in your special day. 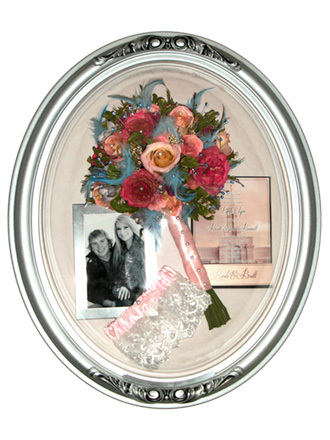 Say "Thank You" to your mother and mother-in-law by encasing their corsages in an oak or rosewood jewelry box, a 5x7 frame with a dome or a 4x7 table dome. 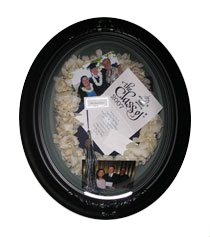 Add other special items to your encasement, such as a photograph, invitation, or your garter! 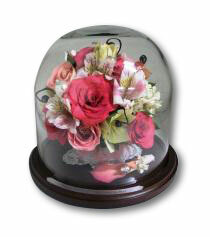 Preserve a floral cake top in a beautiful table dome or glass box—they come in almost any size! From full-length gown to cocktail styles, preserve your wedding dress. 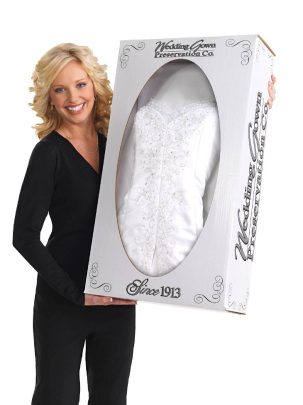 The price includes the dress and three extra items (veil, gloves, garter, etc. ), and comes with a 100 year certificate of guarantee. At times of loss, our family and friends express their love and support through the gift of flowers. 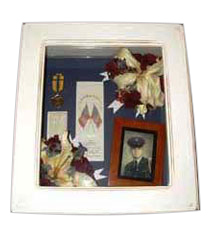 We can use the extensive experience of Suspended In Time® to preserve these special gifts and help you create a memorial tribute keepsake that honors your loved one and celebrates their life. 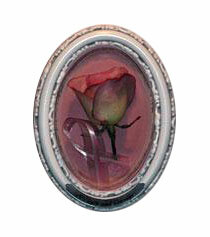 Photos or other items can be included in an encasement along with the preserved flowers. Individual flowers can be preserved for family members. 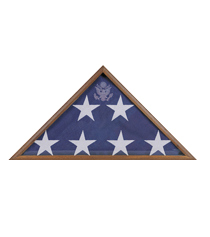 We also encase military flags. 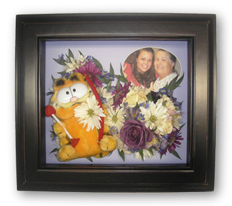 Preserve flowers from proms, anniversaries, Mother&apos;s Day, birthdays, Quinceañeras and any other occasion. 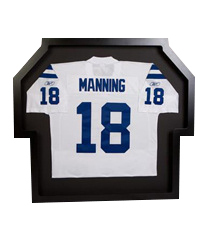 We can do encasements for christenings, military service, sports jerseys, autographed caps or balls, a golfer&apos;s hole-in-one and many other kinds of memorabilia. Sometimes a bridal bouquet does not survive the honeymoon or accidentally gets lost along the way. How about a commemorative? Bring us a picture of the bouquet and we will use the same kinds of flowers to create a custom encasement similar to what could have been done with the originals. 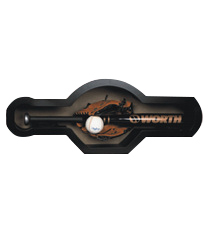 This is a great gift for a special anniversary - no matter how long you have been married! 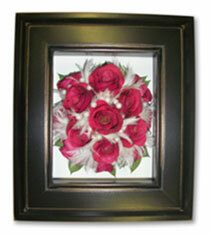 We can do this for other types of special occasion flowers as well. 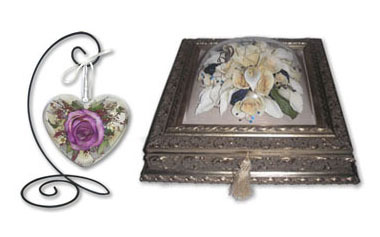 Encasement choices include frames, glass and acrylic boxes, jewelry boxes, ornaments, table domes, framed shadow boxes, and even custom shaped shadow boxes. Many colors and finishes are available. 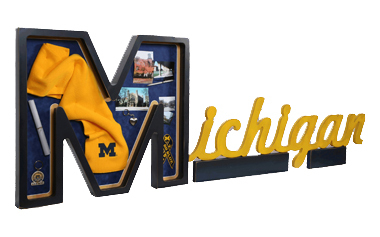 All costs are presented up front with no hidden fees, and include the encasement, a custom design, preservation and/or restoration of your flowers, the inclusion of photos and other memorabilia, an archival quality mat. Serving South Charlotte, Matthews, Monroe, Fort Mill, Rock Hill, York and the surrounding areas, including South ​​Mecklenburg County and York County, South Carolina, and Union County, North Carolina. See the entire catalog of encasement types, styles, and color choices on the Product Choices section the corporate website. See more examples of flower preservations and encasements types in the photo gallery on the corporate website. We encourage your floral preservation to be a part of your wedding planning process. See what flowers preserve well. We're an authorized dealer of Suspended In Time® Inc. Please visit SuspendedInTime.com for additional information and examples. © Copyright 2019 Suspended in Time® of South Charlotte.